Usually around now the leaves should be on the ground, but it has been a dry Autumn so nothing has knocked them loose yet. When they do fall they form a yellow carpet on the ground. Yes, the leaves really are that yellow. Ginkgo's are the sole living link between ancient plants like ferns and more modern trees like conifers. The simple leaves and the conifer-like buds are an indication of this. Leaves from modern trees match those of fossils millions of years old. 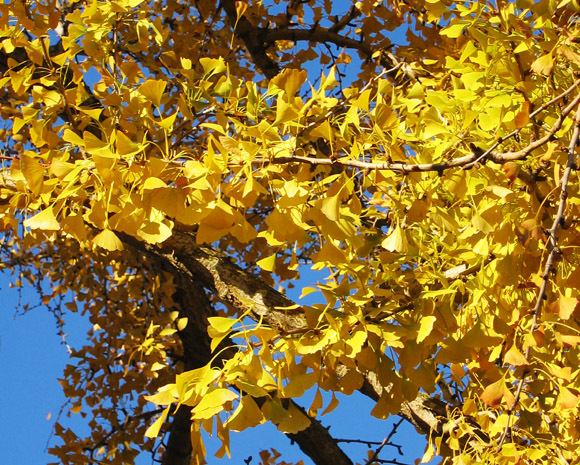 The gingko tree itself has a long life too, with reports of trees up to a few thousand years old. You can read more about ginkgo's at Cor Kwant's "Ginkgo Pages"
The previous article is More about working with the tasks collection. The next article is The Schedule as a Symptom.